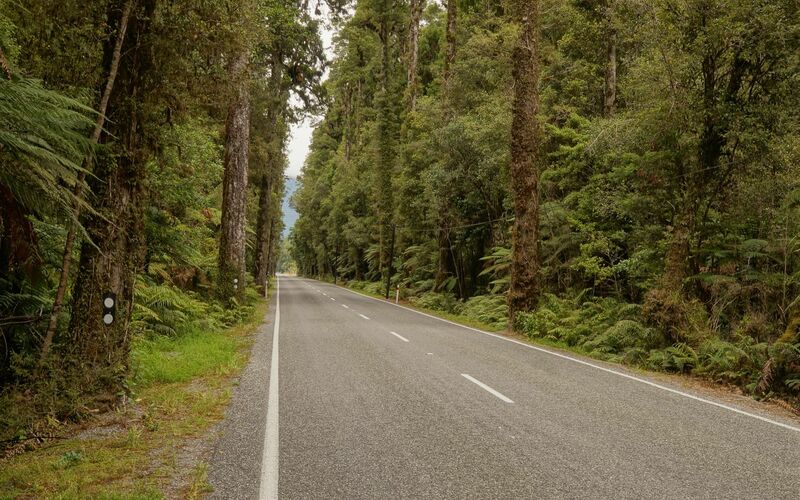 The stretch of road from Greymouth to Haast promises to be a great ride, right up there with last year’s ride on the south coast of Cuba from Santiago de Cuba all the way to Pilon. 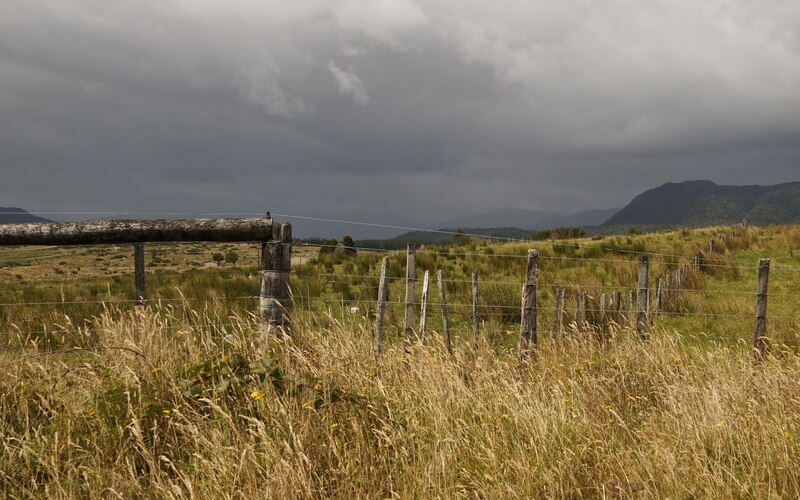 The price of the stunning scenery will be a better than average chance of rain and wind going in the wrong direction, as well as the exquisite torture provided by the lowly sand fly. Well, I had obviously taken the guide-book descriptions too much to heart on this one! Yes, there was occasionally a south wind to deal with but just as often it came from the northwest. As for the bugs – I had always thought the little black things were black flies – they were a bit of a nuisance whenever I went down to the beach, having gotten off my bike. After a couple of beach visits I just ended up slipping on a pair of long pants and from that point – “no worries”. When I got to Queenstown I finally bought some DEET – and then ended up using it only once for the rest of the trip. The predicted rain that puts the “wet” in Westland? 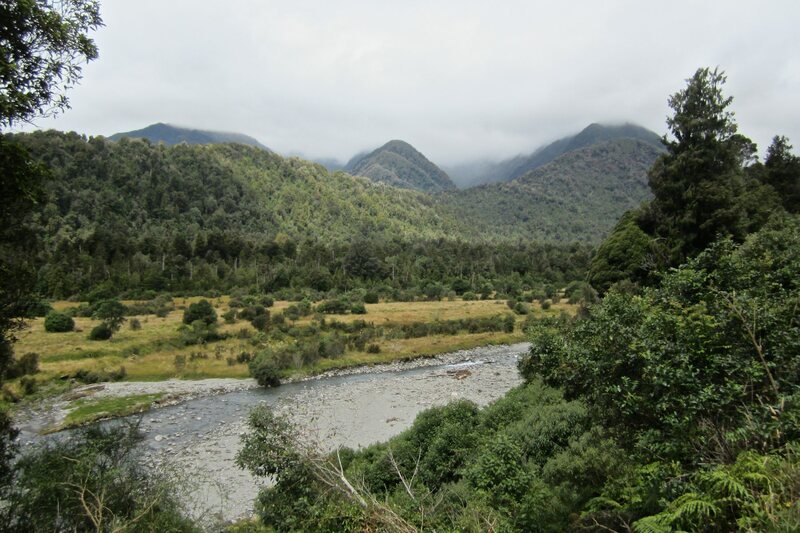 Well, given that it only rained for half a day during my 24-day visit to South Island (and that was the morning I went over Arthur’s Pass to Greymouth), clearly rain was not an issue! Except for that bit of precipitation, my rain gear stayed in one of the front panniers for the entire 1,400-km ride. The moral of the story? By all means, prepare for the worst. But don’t be surprised when it turns out better than predicted. As for the stunning scenery? Maybe the reverse is true here – do expect the best, but don’t be surprised if it is not as spectacular as the guide-book says it is. 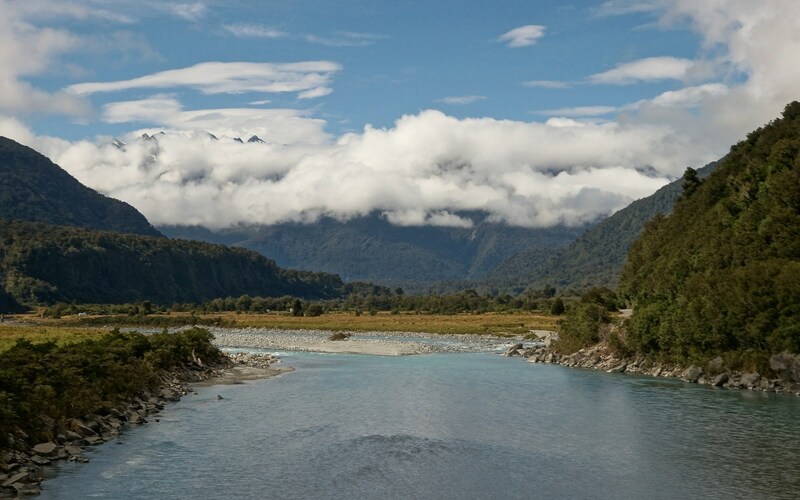 As picturesque as my ride down the West Coast to Haast was, this leg of the journey takes second place to the next one, the ride from Haast to Queenstown. 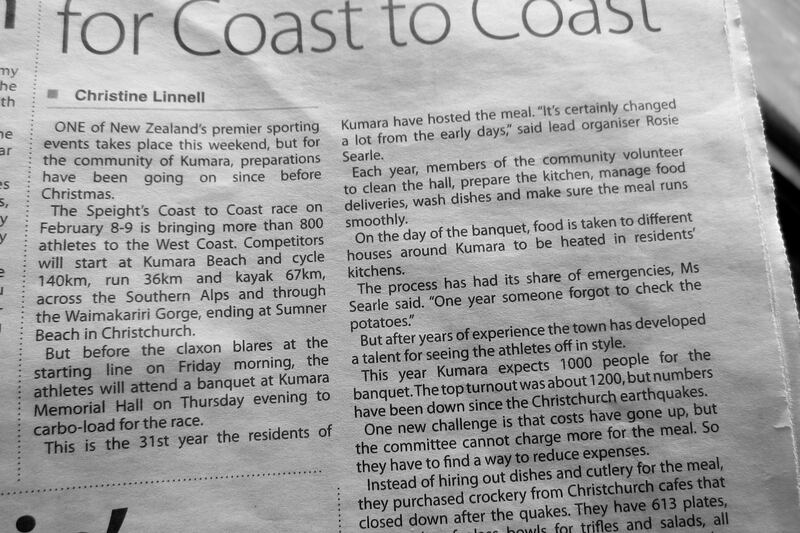 Still, second place on South Island beats first place in most other places! Breakfast at a McKay Street restaurant gave me a chance to talk to my second and third fellow bike tourists of the trip. These Kiwis and were travelling very light. Their trajectory? 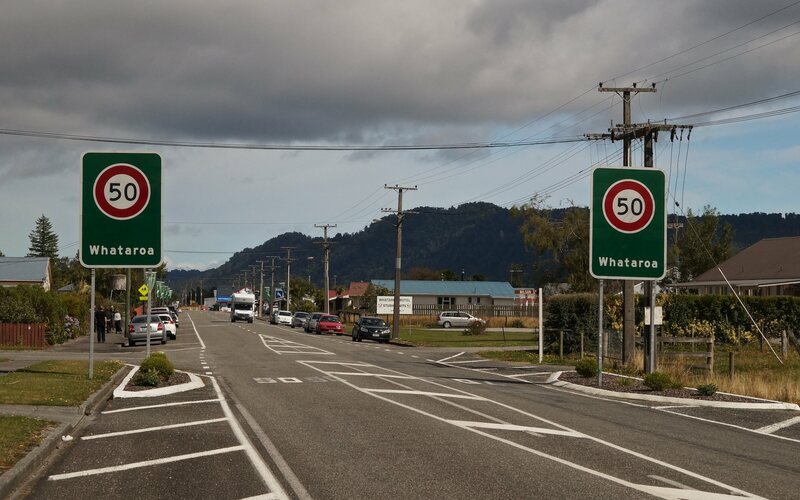 They were doing a ride from Bluff, the southern end of SH6 back up to Picton on the north end of the island, knocking off about 160 km a day! The caffeine ritual taken care of, we headed off in opposite directions. 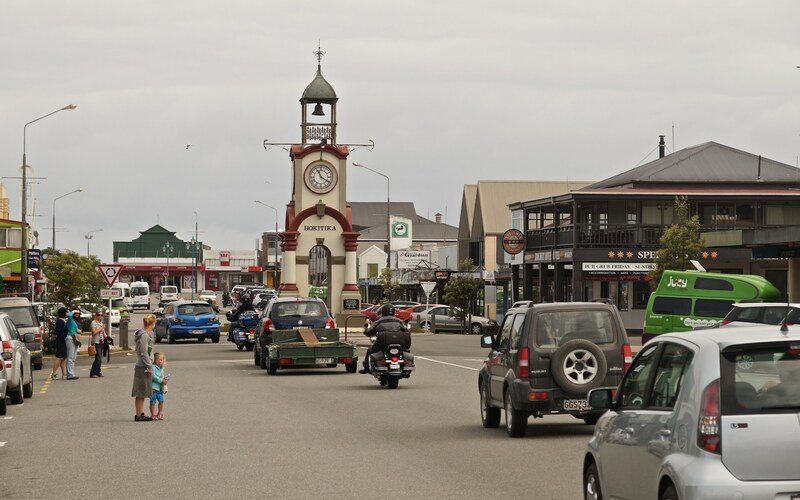 The day’s first aim was the town of Hokitika, some forty-five kilometers to the south along a road that the two Kiwis had described as pretty flat with occasional long straight stretches of five kilometers or more. Also included were a couple of single-lane bridges but as I noted in the post on the previous leg of the trip, this was a non-issue. 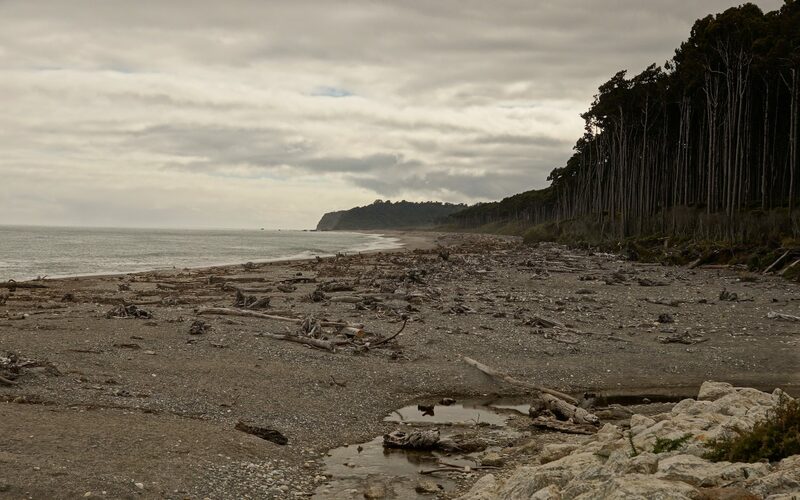 The beach was sometimes visible but mostly separated from the road by a strip of private property. Occasionally I would pass by signs obviously posted by annoyed landowners. 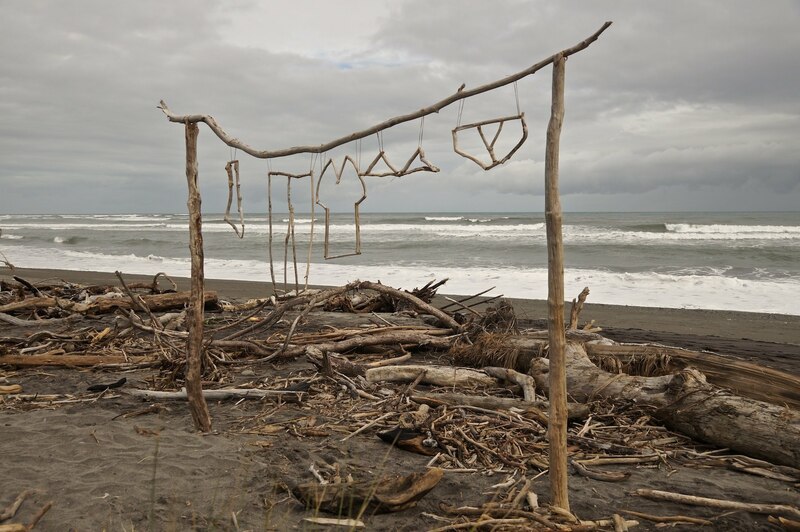 They essentially told folks to stay out of what was called a private beach. That ride along Cuba’s south coast mentioned above actually has you right at the water’s edge with kilometer after kilometer of dramatic hurricane-ravaged road. So – in this case at least, no contest. 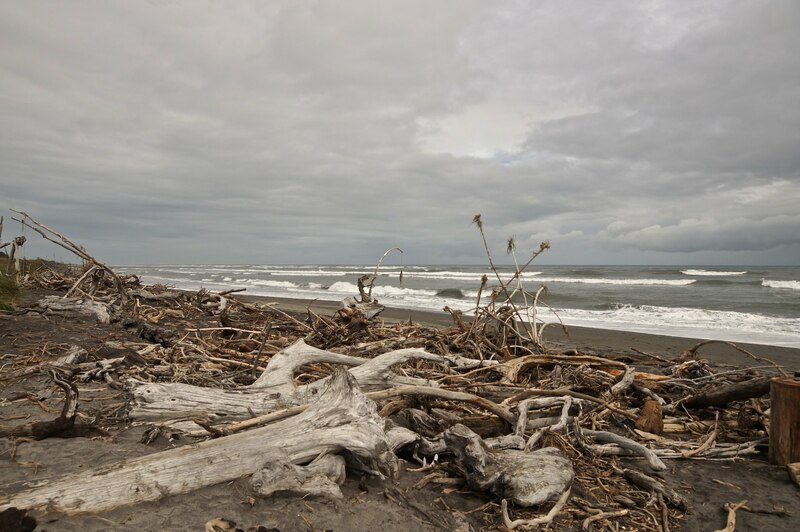 That is what made Hokitika a very pleasant stop – I got to walk right down to the water and take in some of the energy generated when waves meet beach. And to think I was planning on just cycling by to save a bit of time before lunch at Ross! Sometimes gobbling up road miles becomes too much of an obsession and you forget the reason you’re there. The hour I spent chillin’ on the beach was one of my favourite little zen moments of the trip. One of the people I ended up chatting with was the woman in the image above; she was walking along the beach with her yearling to desensitize him to the sound of the crashing waves; not in the picture was her dog Tilley, busy chasing down the waves in crazy bursts of beach running. Had I not been locked in to getting to Harihari that night, I would have spent the rest of the day on the beach and walking around the town. It just had a nice vibe to it. 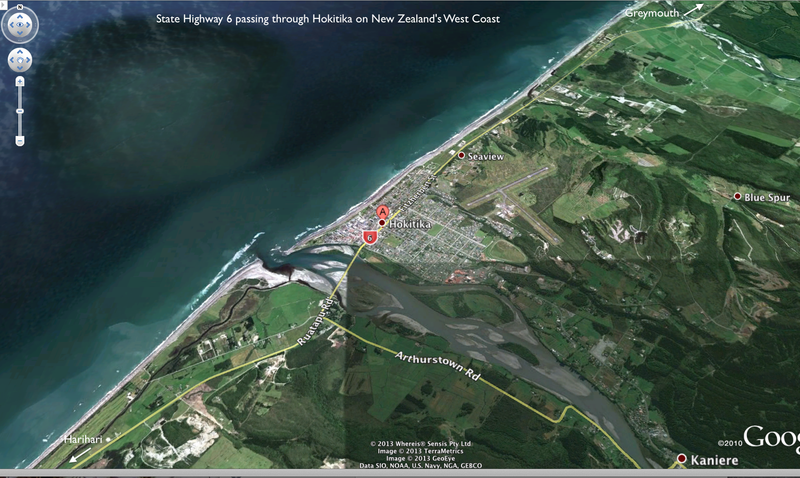 My immediate focus – to get to Ross for lunch and then to deal with the rest of the day’s 112 km. 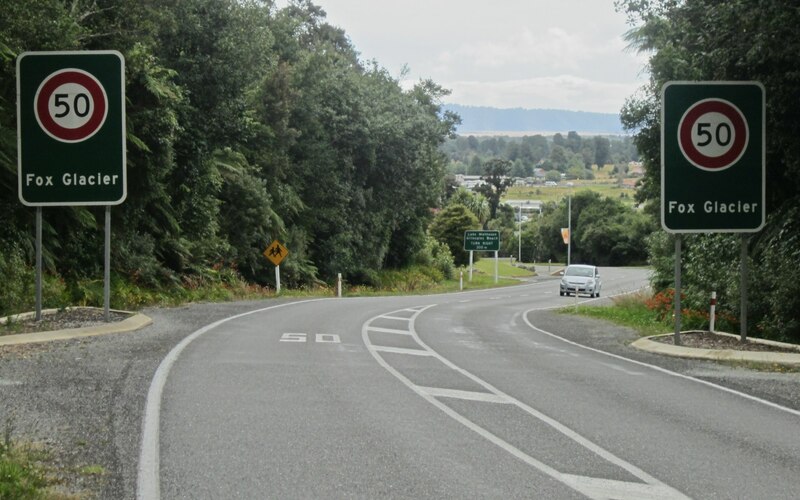 a stretch of road north of Ross on SH6 – notice the paved shoulder! There isn’t a lot at Hari Hari but it does have the reputation of being a good place to crash! (This reputation goes back to the day in 1931 when the Aussie who flew the first solo trans-Tasman Sea flight from Sydney to New Zealand crashed his plane not far from Hari Hari.) I had booked a room for the night at the Hari Hari Motor Inn. 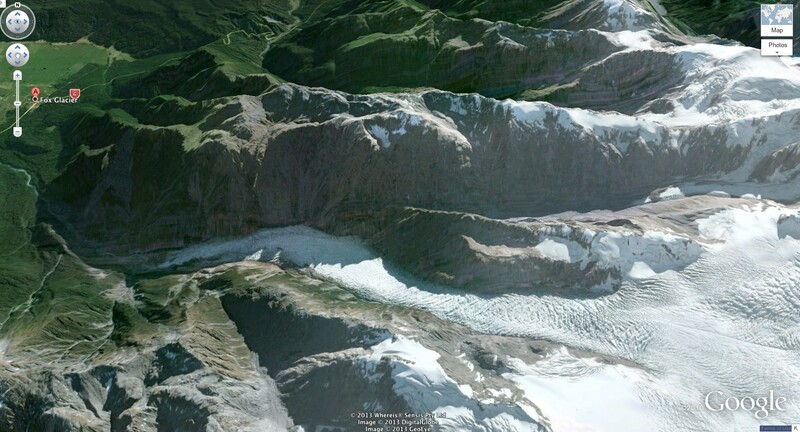 Click here to open a “live” version of the above map! Within the first half-hour after leaving Harihari I had my first bump of the day to deal with – Mount Hercules, a climb of about 200 meters. 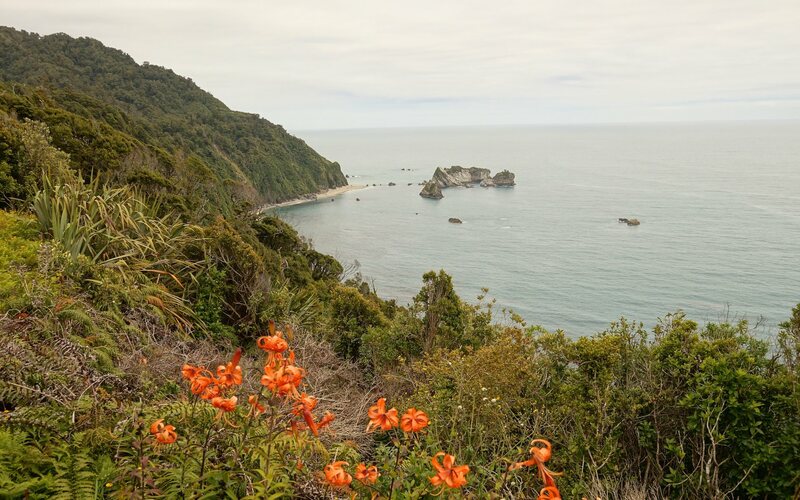 The reward was fifty-five kilometers of gently rolling road with the Tasman Sea on my right and the rainforest and southern Alps to my left. 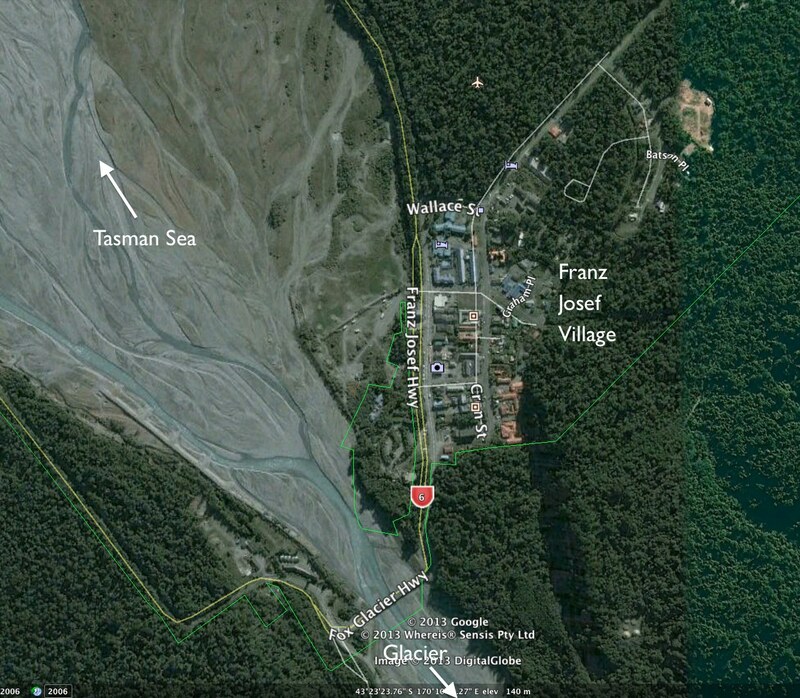 The last twenty kilometers to Fox Glacier Village consists of three steep climbs and downhills in a row. I had booked a room at Ivory Towers in the Village so didn’t have to spend any time looking for accommodation when I rolled in. Within the first thirty minutes there I bumped into a half-dozen fellow cyclists and exchanged road trajectories and info. Walking about a kilometer along a well-groomed trail takes you to the lake. At a scenic lookout on the edge of the lake itself you line up with the other “pilgrims” to snap your take of “the view of views”. The one I got is the first image in this post! 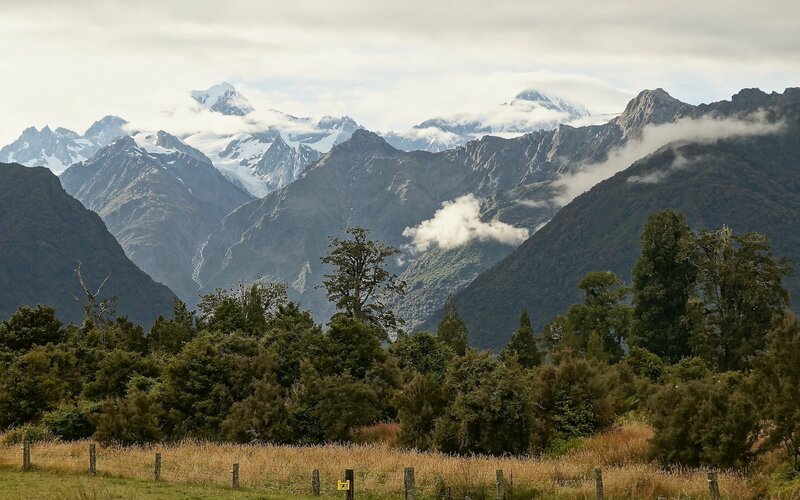 I will admit that it was my best view of the Southern Alps since cycling over Arthur’s Pass down to the West Coast. 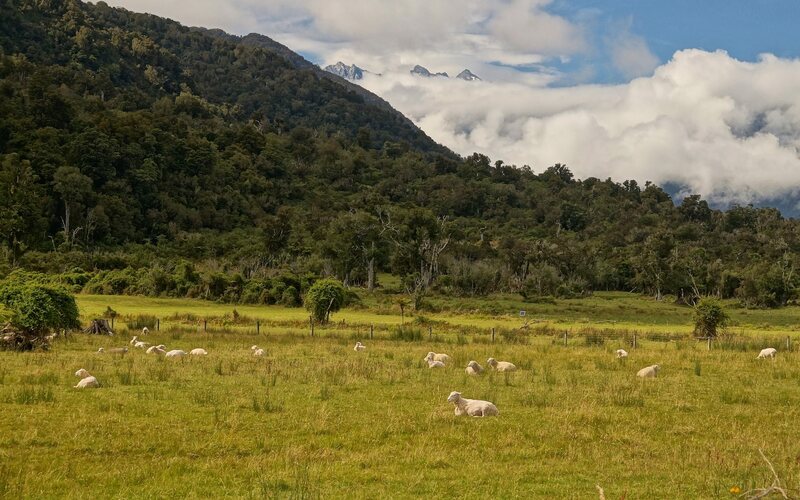 I had thought that I would feel the looming presence of the mountains as I cycled down SH6 but it was really only near Franz Josef that I did – and even then the rainforest between the mountains and the road prevent you from seeing much. Bridge crossings over rivers were the exceptions – as one of my shots above shows. 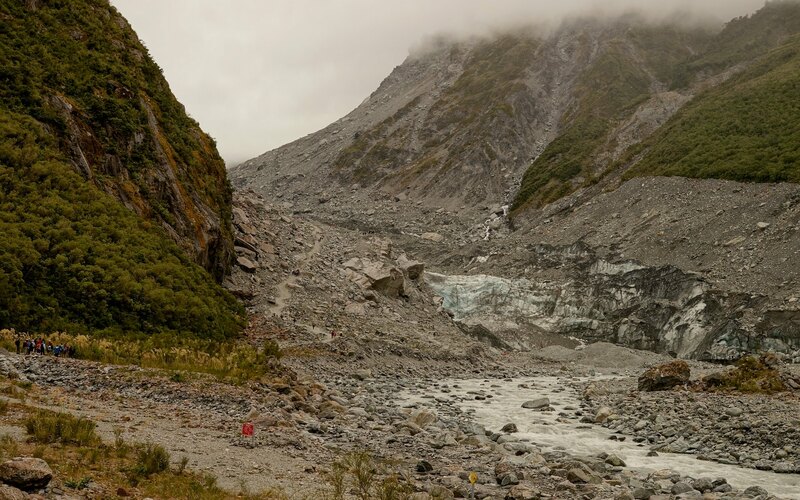 In the afternoon, after a lunch at the Cook Saddle Cafe (and Saloon), I cycled up the the rainforest trail to the glacier. Then, after locking my bike to a post in the parking lot, I walked as far as the trail went without going into “with guides only” territory. 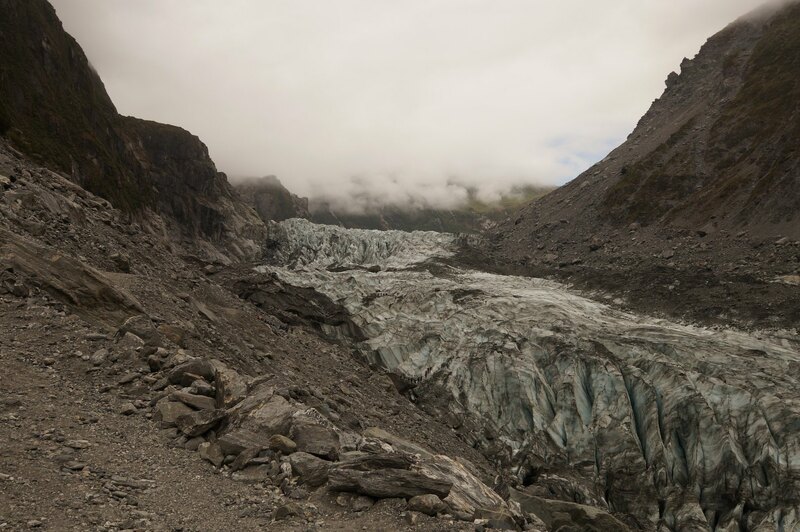 Low-hanging cloud did obscure the view of the upper reaches of the glacier but I did get to see the toe – and watched fellow tourists who have spent NZ$115. as they did their one-hour guided walk on the ice in the provided crampons. 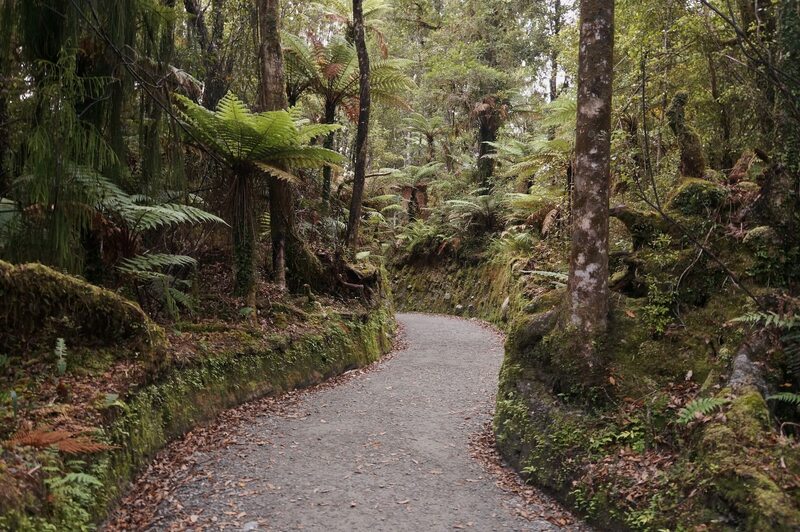 On the way back to the village I tried to capture the incredible feeling of cycling along the rainforest trail. With one hand on the handlebar brake lever and the other holding the camera as stable as possible – i.e. not very – I came up with this bit of video. After you’ve taken your Gravol, take a peek! 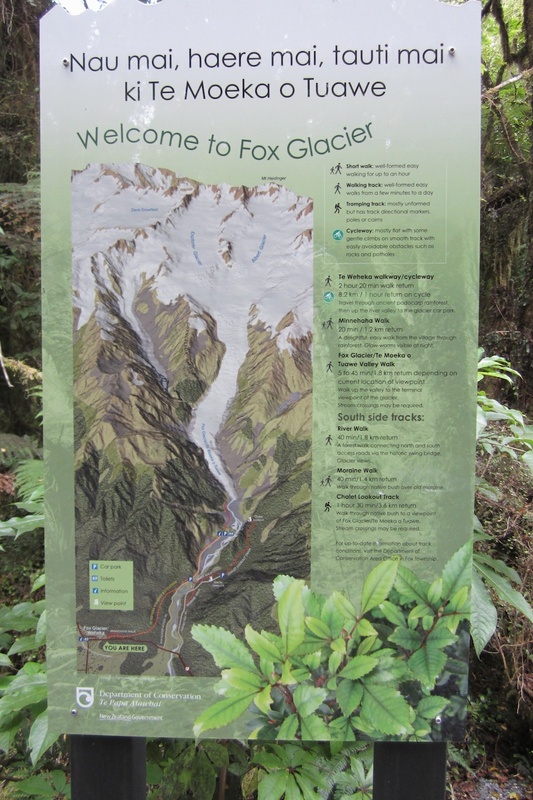 A fairly relaxing day at Fox Glacier done, the next morning I continued on south to Haast. A slight wind blowing my way made the first bit a nice ride. 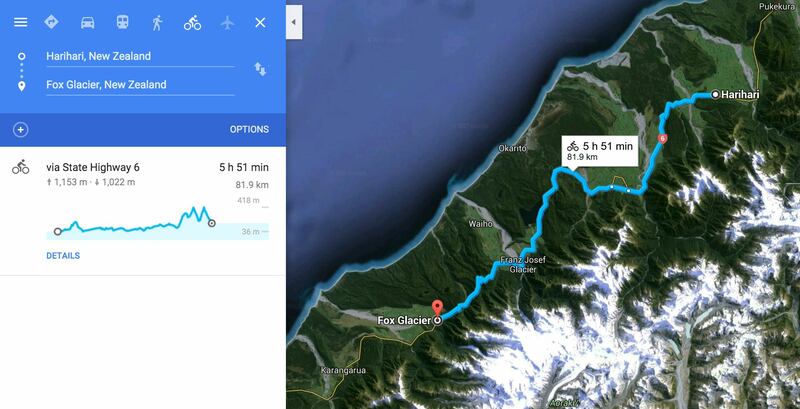 The first eighty kilometers are mostly flat, after a nice bit of downhill leaving Fox Glacier Village. 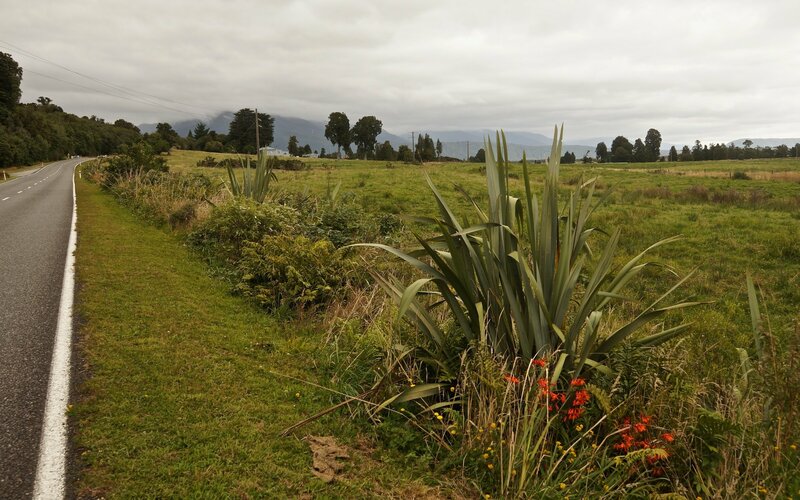 It is with about thirty kilometers to go that the day’s hills appeared; the high point was Knight’s Point. At the lookout there I wheeled over to the picnic table where I thought a couple of English cyclists I’d seen at the Ivory Towers’ Hostel the day before were sitting. But no! 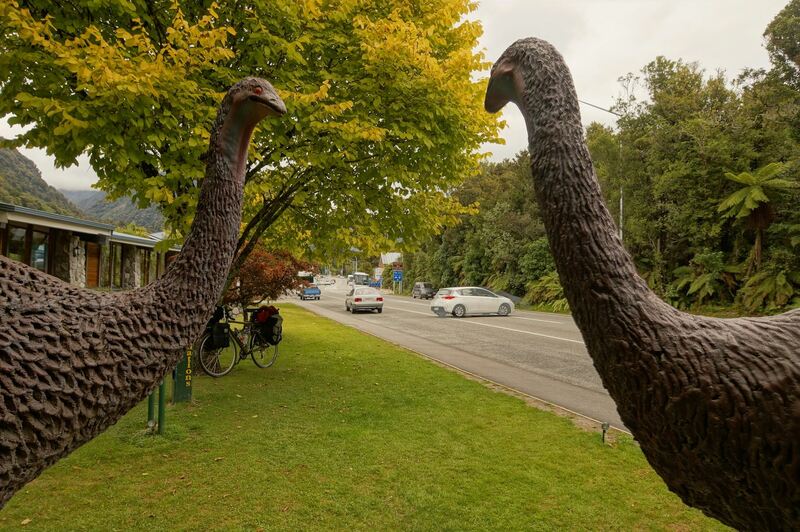 These two guys were Belgians on their way up to Picton from Queenstown. I was able to make use of my French as we chatted a while. While they readied a lunch of macaroni and cheese, we exchanged typical biker road info. One thing we agreed on was that there were more bike tourists on the roads of South Island than anywhere any of us had been before. 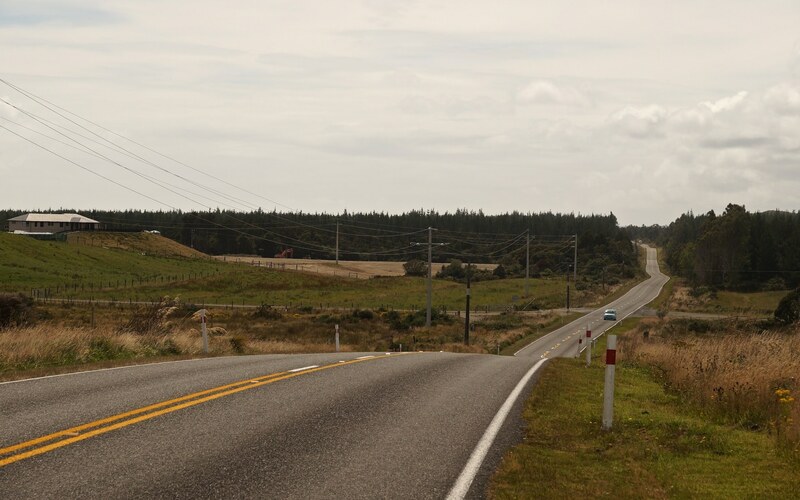 After seeing three people on the first leg of my trip, I had counted about sixteen since Greymouth. In fact, there were so many that I was no longer feeling guilty about not stopping and chatting with each one that went by. In my 1990’s trans-Canada and recent Cuba trips, fellow cyclists were a relative novelty and the situation almost demanded a stop-and-exchange-greetings-and-info. Not on South Island NZ! 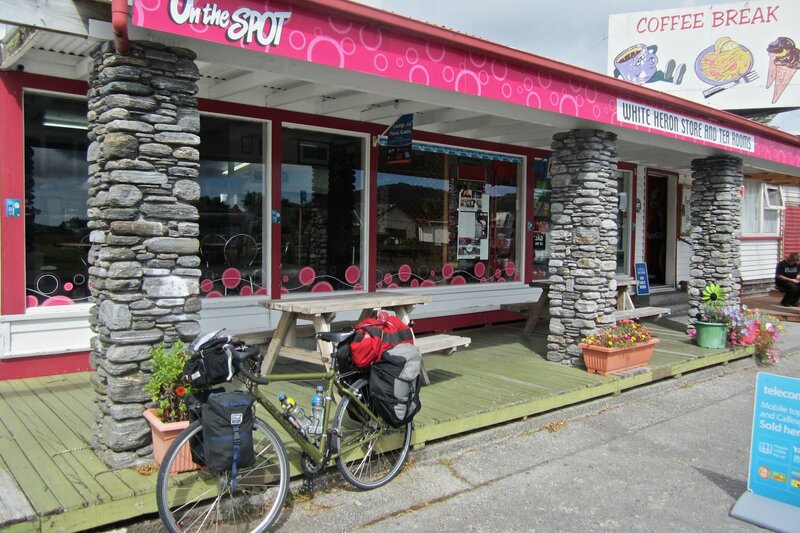 Had I been tenting all the way down the West Coast Road, I would have met even more cyclists in the various campgrounds favoured by the hard-core cycle tourists instead of the plush motel option I embraced. 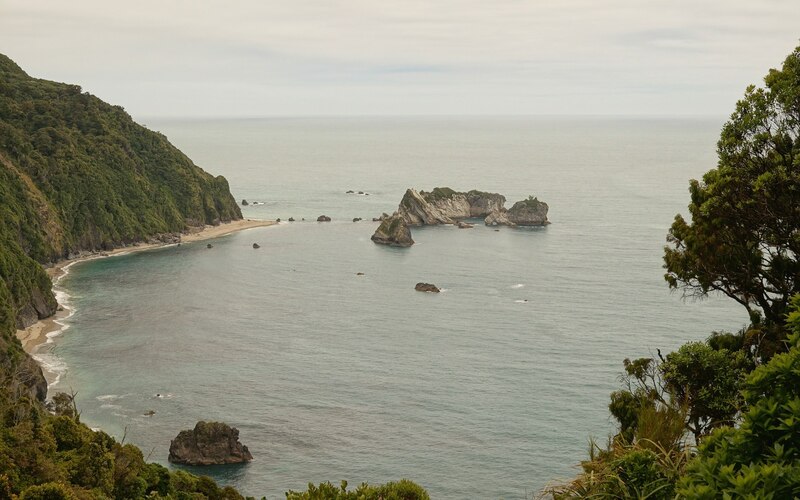 Let’s just say that there is no reason not to go cycling in New Zealand on your own – you will meet all the people you want to meet! 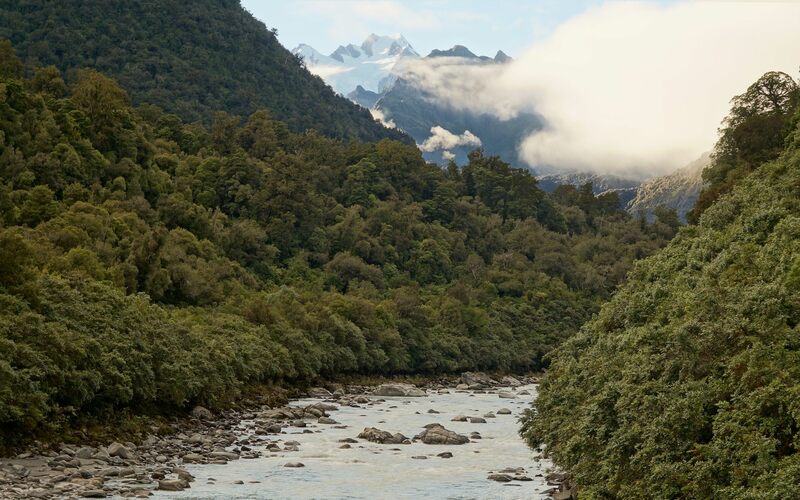 The day ended with about fifteen km of fairly flat terrain to the end point – Haast Township, four kilometres past Haast Junction to the Haast Visitor Center. 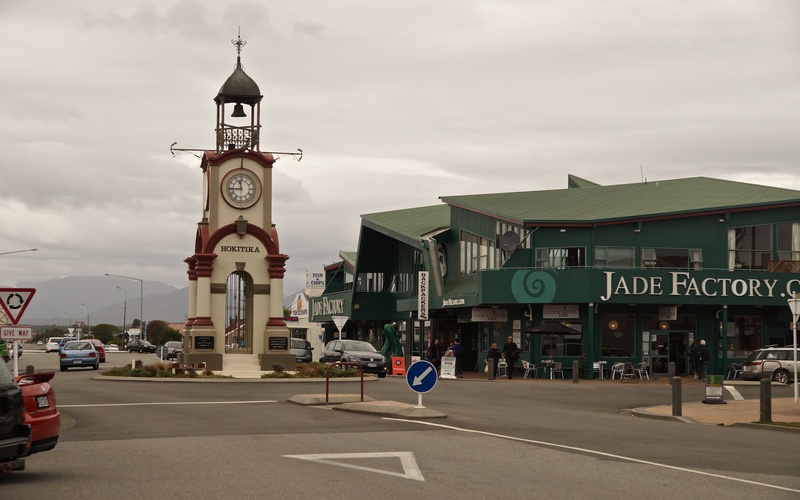 There is a secondary road, one which follows the coast all the way to Jackson’s Bay, which meets SH6 at the Junction. 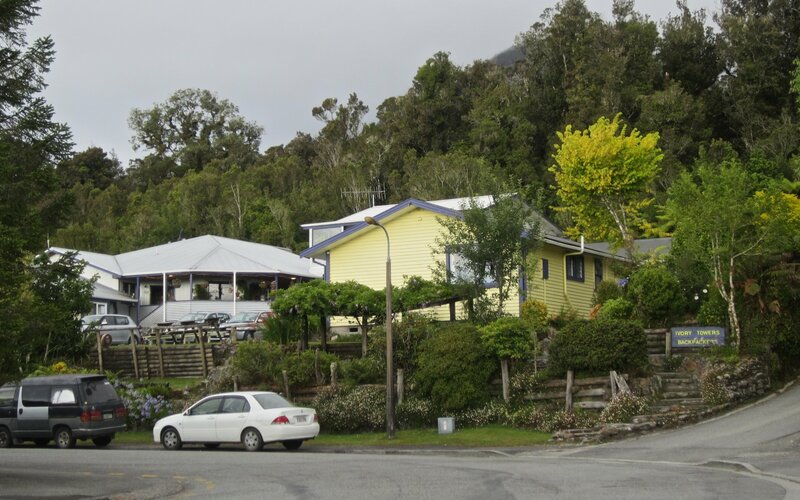 I stayed on SH6 and fifteen minutes later arrived at the Heritage Park Lodge in beautiful downtown Haast (population 40!). Near the motel are a convenience store and a restaurant and, I think, a laundromat. 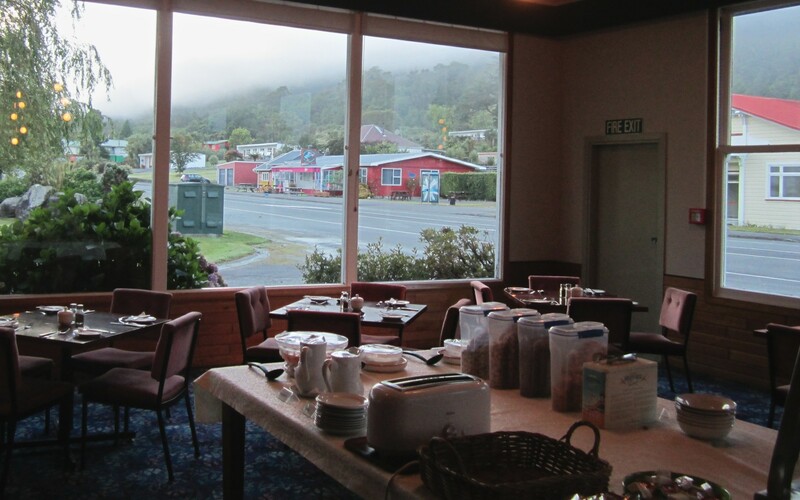 As seems to the norm on South Island, the room also included an equipped kitchenette and like all the other rooms I rented, was very nicely maintained. 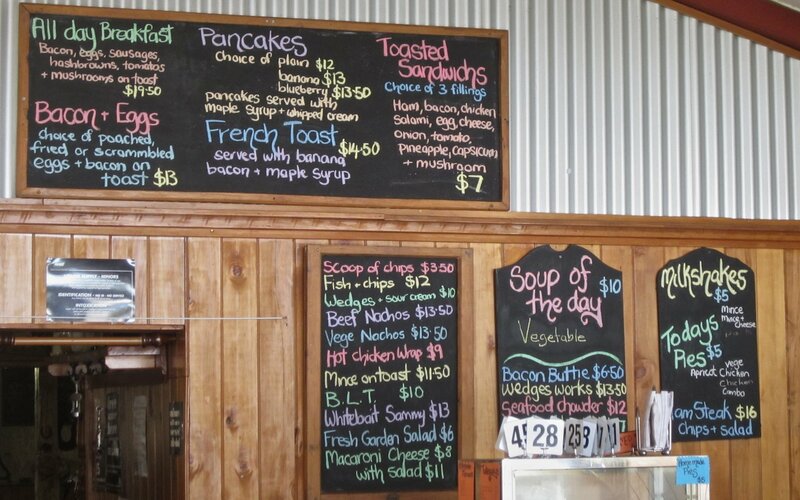 All included wi-fi internet access (usually limited to 100 or 200 mb). The typical cost of room rental for one night ranged between $95. and $110. with prices being a bit higher (i.e. NZ$130.) in Christchurch. Having a cycling partner would have reduced my accommodation costs almost by 50%; that is the price you pay for flying solo! In the grand scheme of things, it really is not that big a deal – and it certainly is nice to have a bug-free, warm and dry place to stretch out after a day on the saddle. 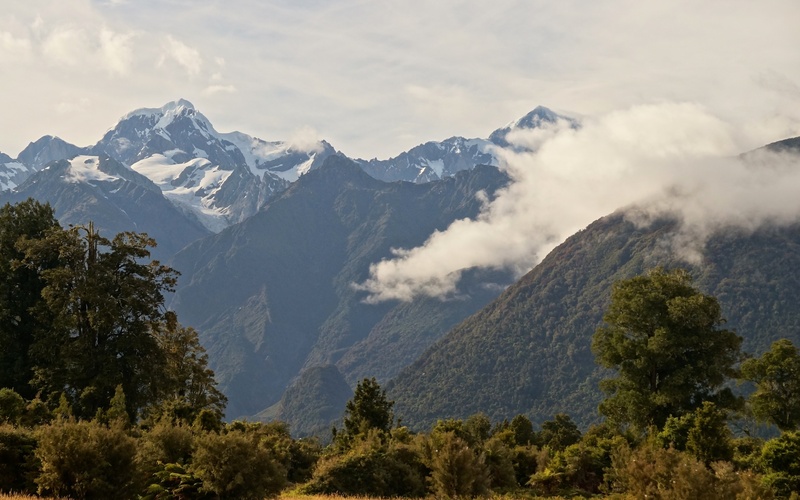 The next day I would start the next leg of my South Island ramble, heading over the Haast Pass to Queenstown over a three-day period. 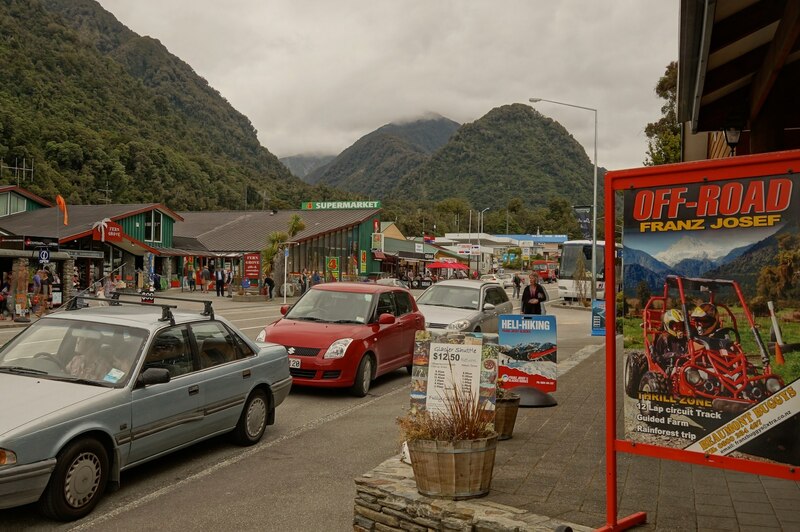 Click here if you want to see some more stunning South Island vistas and the strips of pavement that seem to figure so prominently in my pix! 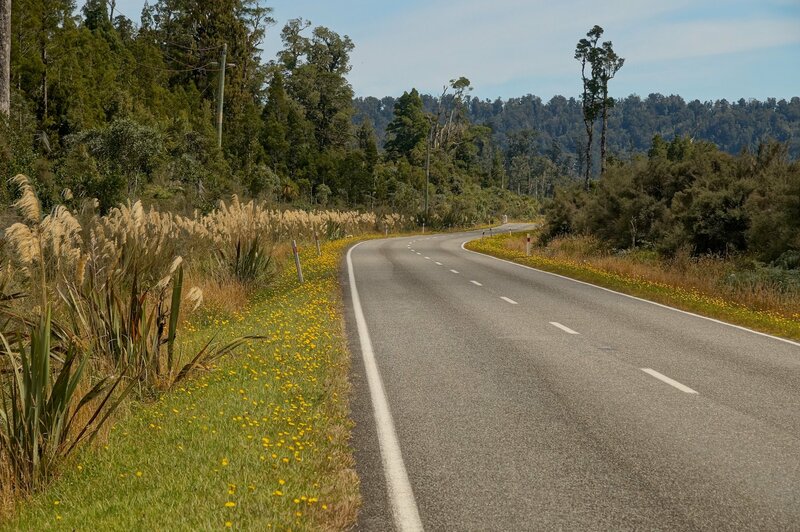 The route to Queenstown from Haast – and especially the section from Wanaka to Arrowtown – rate as my favourite of the entire trip! 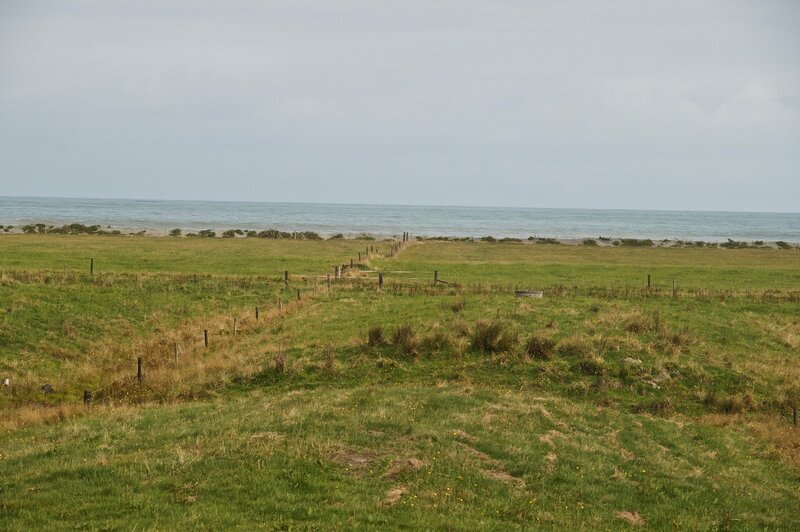 If it is more info on the West Coast Road you are looking for, an excellent post by a Canadian couple – actually, their entire travellingtwo blog is a goldmine of info – can be found here. 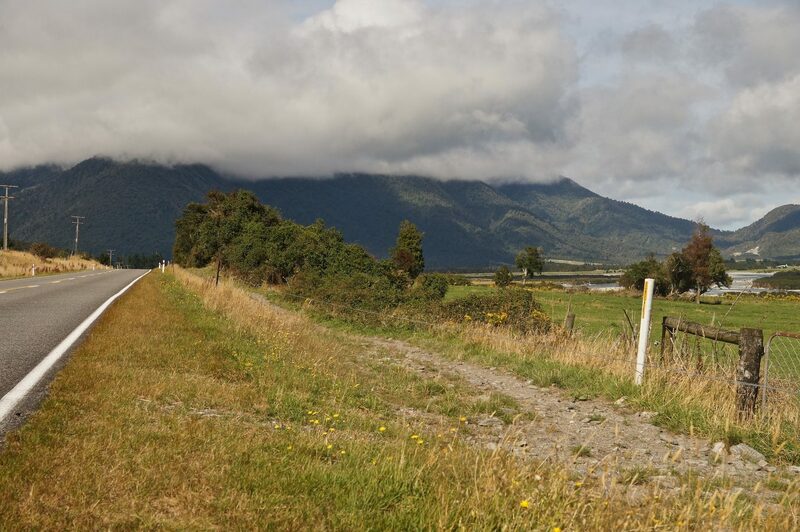 As noted in my Part One in this series of South Island posts, I also found the 2009 Lonely Planet Cycling New Zealand guide to be very useful in planning my route, not just down the West Coast Road, but also the stretch from Christchurch to Greymouth, and the rest of the trip. The guide will hopefully be refreshed in 2013 and will then present that much more recent information and planning guidance. The Pedallers’ Paradise set could also use a true updating (as opposed to the slapdash one it got) that eliminates the glaring pieces of outdated information. 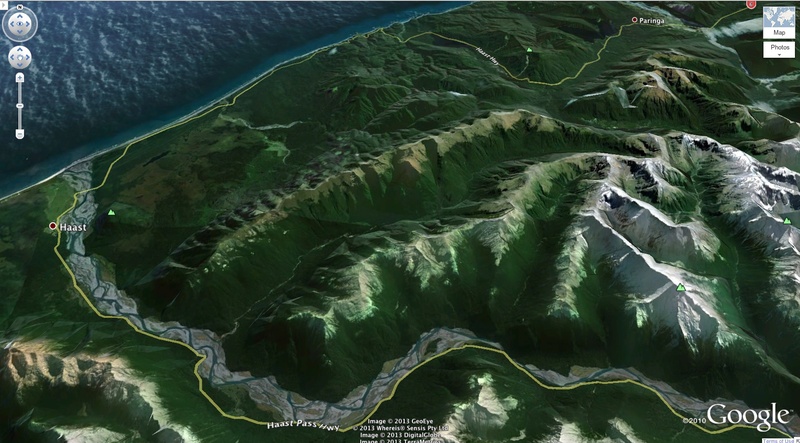 Next Post: Part 5 – Over The Haast Pass To Queenstown. This entry was posted in bicycle touring. Bookmark the permalink. June, while both stretches of road -i.e. 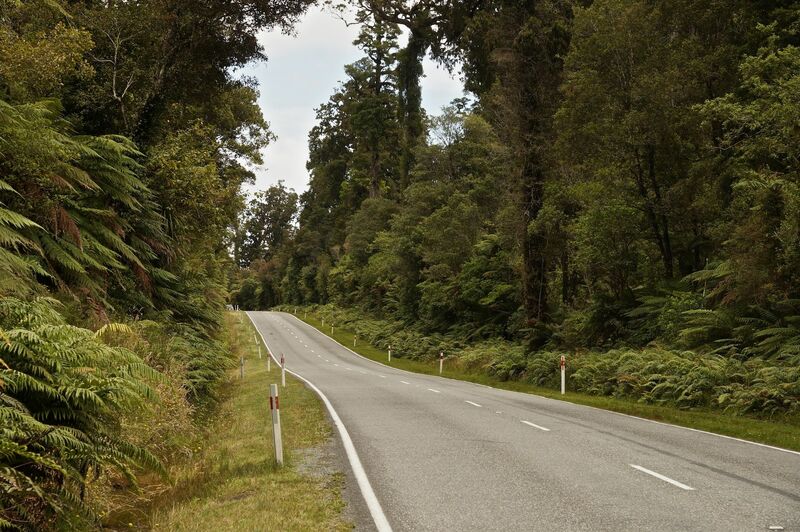 NZ’s West Coast road and Tassie’s east coast- make for great rides , I’ll admit that NZ would be my first choice. 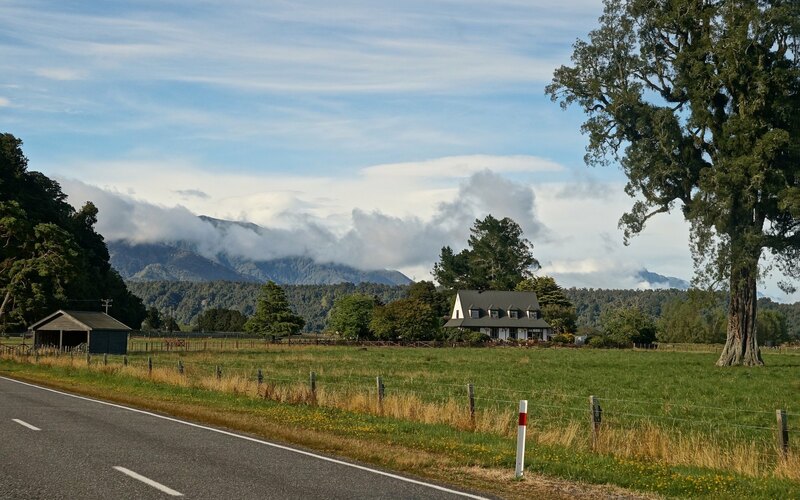 In both Tasmania and In NZ taking a bicycle along on the bus is hassle free so you could make use of them as part of your route planning. 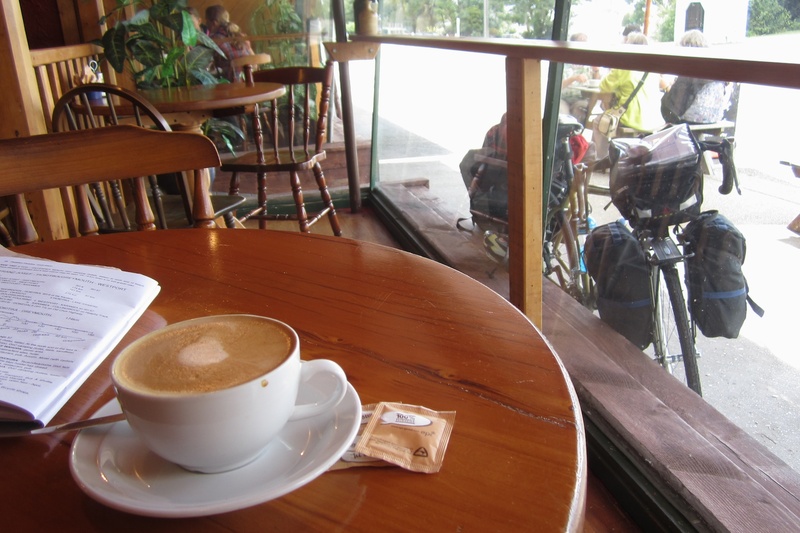 The Tasmania ride I did from Hobart to St. Helens took five pretty leisurely days. 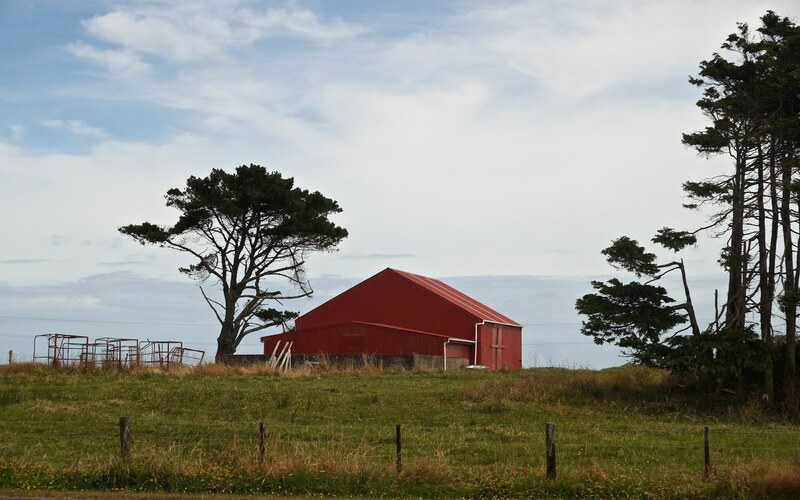 You might consider just a trip down to Bruny Island from Hobart and spending two or three days on Bruny island. There is way more to see than I got around to during the day and half that I was at Adventure Bay. The boat ride to the south end of the island is also a must! 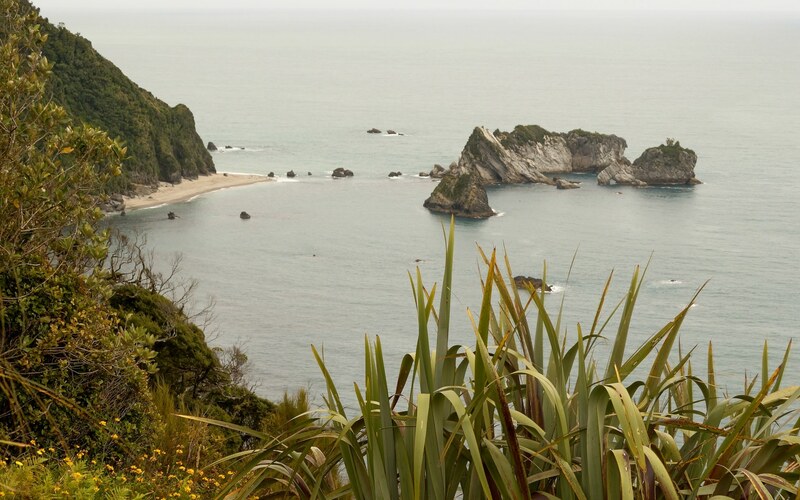 In NZ the train from Christchurch to Greymouth – the TranzAlpine – would get you to the coast in luxury. 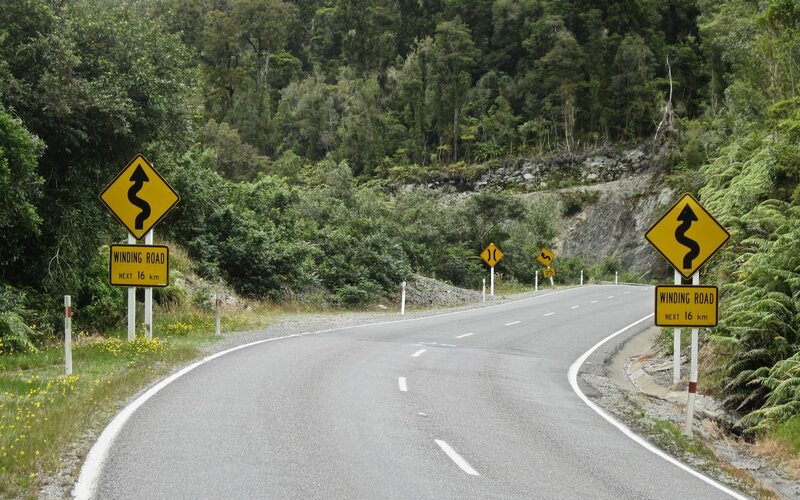 NZ’s South Island has lots of bicycling possibilities. 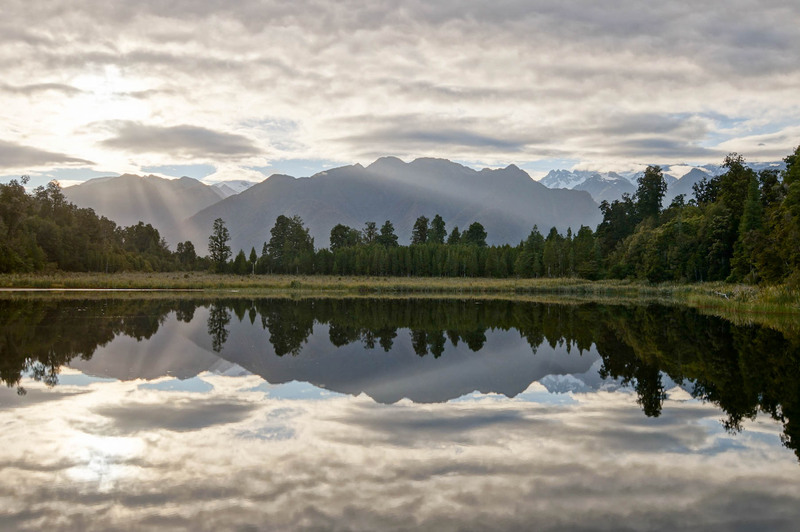 Basing yourself in Queenstown would open up a week’s worth of day tours or a couple of overnighters. It all comes down to how keen you are, what gear you’ll have, and how fit you are! Have fun choosing! P.S. – There is no bad choice!